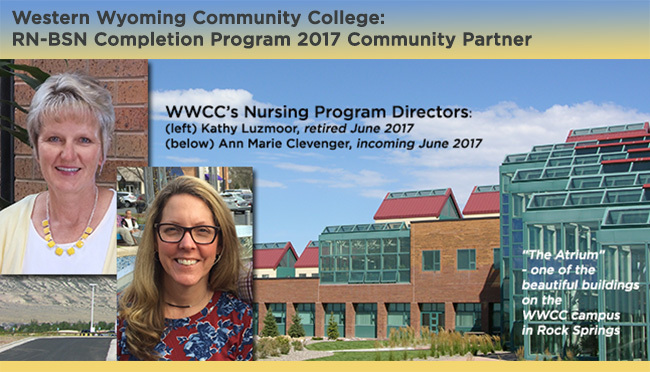 The University of Wyoming Fay W. Whitney School of Nursing named Western Wyoming Community College in Rock Springs the Community Partner of the Year 2017 for their work with the "RN-BSN Completion" program. The award was presented at the Wyoming Nurses' Convention in Laramie, Wyoming on September 21 in the Hilton Convention Center to current WWCC Nursing Program Director Ann Marie Clevenger by UW RN-BSN faculty Linda Williams. The WWCC nursing staff set an example for students as they set about to encourage higher education. “I’m a UW nursing alum 1985 BSN, 2009 MSN,” says Kathy Luzmoor, recently retired from the program director position. "Ann [Clevenger, incoming program director] also received her BSN from UW. Six of our full-time faculty are UW alumni.” So not only have faculty been focused on advising students of the need to pursue a bachelor’s degree, they have patterned that path for their students.